We last found 3rd Bass releasing their debut The Cactus Album , which brought them modest success as it would earn our caucasian brethren a gold plaque. The next year they released The Cactus Revisited which was an EP that consisted of remixes from the original album along with 1 new song. This was all a ploy to fill in the down time between the debut album and the official follow-up that would drop the following year. 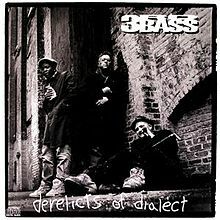 3rd Bass dropped Derelicts Of Dialect in the summer of 1991. The majority of the production on The Cactus Album was handled by Sam Sever (some might remember him from the short-lived group Downtown Science). Sever handles a decent chunk of the production on Derelicts Of Dialect as well, but they also brought in Prince Paul (who was riding high on the success of his production work on De La Soul’s first two albums) to produce a handful of tracks. Derelicts Of Dialect would go on to earn the duo their second and last gold plaque as they would disband the following year. Serch and Pete along with Richie Rich, made attempts at solo careers, but neither of them would reach the same level of success they did as a team, bringing truth to the old adage: there is power in numbers. The Merchants of Grooves – Standard hip-hop album intro, complete with a Richard Pryor vocal sample about white people. I love the trumpet sample that this opens with. Derelicts of Dialect – Prince Paul provides a dark instrumental (that uses the same source material that Black Moon would later use on their joint “Slave”) for the title track for Pete Nice and Serch to spit on, and our melanin challenged brethren don’t disappoint. Nice way to kick things off. Ace In The Hole – 3rd Bass invites their buddies from KMD (who also provide the instrumental) to spit on this one. Our hosts don’t waste anytime going in on Vanilla Ice (which would be the first of several attacks on Robert Van Winkle during the course of Derelicts Of Dialect ) as Serch takes a direct shot at him during his verse. Zev-Love X and Onyx don’t add much to this song, as I have no idea what they’re talking about, and have very little interest in decoding their hidden messages either . I am curious to whose name was censored during Pete Nice’s shoutouts at the end of the song, though. I didn’t care much for this one. French Toast – The first of several interludes. Portrait of the Artist As A Hood – Serch and Pete use this one to stake their claim as hood approved emcees. Sam Sever provides a decent instrumental. I remember Sam Sever’s remix (which was used in the video for this song), which was a vast improvement from this version. Pop Goes The Weasel – This was the lead single from the album, a direct shot at those hip-hop acts that were intentionally making records for pop audience consumption, specifically Vanilla Ice. The video for this song has a Vanilla Ice impersonator getting abused by 3rd Bass. The Stimulated Dummies get the production credit for this one as they combine a little Peter Gabriel, Stevie Wonder, The J.B.s, The Who, and for S&G, a little Walt Disney. Great song. I wonder if 3rd Bass had any idea that this song would still be relevant for hip-hop music over two decades later. Daddy Rich In The Land of 1210 – An ode to their deejay, Richie Rich. They even give the floor to Rich at the midway point of the song to showcase his techniques. I could take it or leave it. Word To The Third – Sam Sever returns on the production side of things to provide a decent instrumental for our host to get down on. I guess I’m still waiting for Sever to match the perfection that was “Sons of 3rd Bass”. Derelicts Of Dialect isn’t any stronger for having this song on it, nor would it be any worse for leaving it off (this is the true definition of a filler song). Note to all artist: if your album is stacked with 23 tracks, there is really no need for filler material. Prune that mess, son. Herbalz In Your Mouth – Prince Paul pops up for his second production credit of the evening. Not his best work but it’s a decent enough instrumental for Serch and Pete to get silly on. Al’z A-B-Cee’z – Hi-larious interlude. No Master Plan No Master Race – Serch and Nice use this Sever instrumental to discuss race relations. It’s just too bad they used the most generic Sam Sever instrumental they could find to get their point across. Come In – Another Prince Paul produced joint. Decent. No Static At All – Now that’s more like it. Prince Paul steps up his game and provides some heat in the form of a stabbing organ sample for the backdrop and our host do a pretty good job keeping pace. Well done. Eye Jammie – Back in the day I found this interlude hi-larious. Today it got a mild chuckle out of me. Maturation. Microphone Techniques – Serch and Nice invite Nice N Smooth to join in on this cipher joint, and none of the parties involves disappoint. Like his contemporaries, Sam Sever doesn’t disappoint either as he provides a strong backdrop for the participants to get down on. Problem Child – Our hosts switch gears to tackle a little social commentary as they focus on a few different scenarios of troubled inner-city youth. Sever samples Blue Oyster Cult’s “Godzilla” for the backdrop, and it works pretty well. 3 Strikes 5000– This was first released on The Cactus Revisited . This mix has a different instrumental than the original. The Stimulated Dummies are responsible for both. I prefer this mix. That’s all I got. What an awkward paragraph. Kick Em In The Grill – Chubb Rock stops by to drop a verse on this one, as he bats third and completely knocks this one out of the park (taking yet another shot at Vanilla Ice…man, was he an easy target back in the early nineties). Random factoid: this is the original to the sequel “Back To The Grill Again” which Serch would release on his solo album the following year, featuring Chubb Rock, Red Hot Lover Tone, and one of the first appearances on wax from the lyrical genius Nas. Green Eggs And Swine – Prince Paul gets his final production credit of the evening, but unfortunately it’s as bland as tap water. Sounds like Serch takes a shot at X-Clan (who fired the first shot on To the East, Blackwards ) on this one. I didn’t care much for this one. Derelicts of Dialect (SD50 Remix) – This Stimulated Dummies mix has nothing on Prince Paul version. Pop Goes The Weasel (Radio Edit) – I couldn’t tell the difference between this radio edit and the original. They say its different, so I’ll take their word for it. M.C. Disagree And The Re-Animator – What better way to close an album than with an inside joke that only the host and their crew would understand, leaving the rest of the listen public completely alienated. Thank you. After revisiting Derelicts Of Dialect , the first word that comes to mind is bloated. I enjoyed the chemistry between Serch and Pete on The Cactus Album . Serch and Pete’s ying and yang personalities balanced out nicely as they could easily move from playful banter to social commentary without missing a beat and still entertaining the listener. At times that same synergy can be found on Derelicts Of Dialect , but for every song that works, there’s a forgettable one to match it. Knock off 10 to 12 of Derelicts Of Dialect 23 tracks and it would easily go from a decent album to rock solid.